Although representing a support service company, Joshua was really here to talk about the Koha ILS. 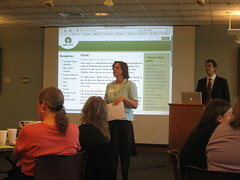 I didn't know much about Koha before this, but during Josh's sixty-minute talk, it became my favorite library tool. It originated in New Zealand, but has since been implemented in American libraries, too. The beauty of its open sourceness is that libraries are not tied to a single vendor for support and developments - we can do things ourselves, or benefit from the contributions of others in the community, or pay companies like LibLime to do the development for us. And of course, this is all to our specifications and on our timetable, rather than that of a vendor who is more interested in profiting off of us than in serving our patrons. Koha also offered some other cool features, like a page translation option, varied interfaces for adults, kids, etc., and much more.